PennsylvAsia: Tzu Chi Lunar New Year Blessing Ceremony, January 27 in Oakland. Tzu Chi Lunar New Year Blessing Ceremony, January 27 in Oakland. 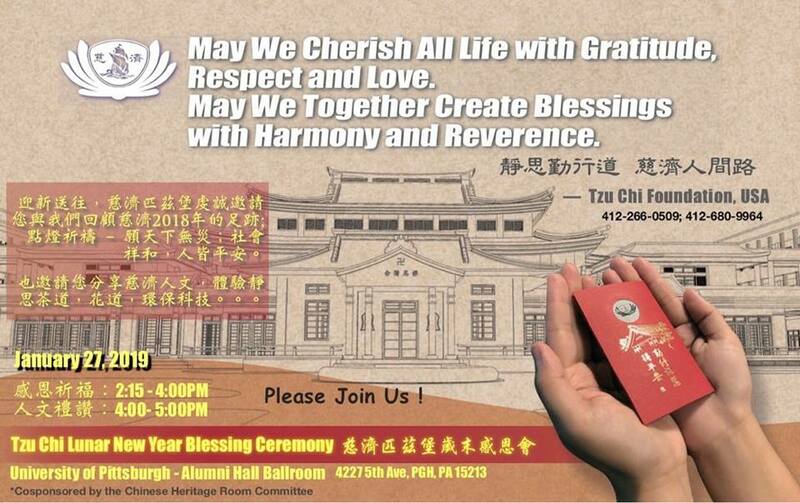 Pittsburgh's Tzu Chi Academy will host a Lunar New Year Blessing Ceremony on January 27. The event starts at 2:15 pm at the Alumni Hall Ballroom on the University of Pittsburgh's campus in Oakland (map). is to provide the local children from kindergarten to high school with quality program not only aimed at student’s language learning but also character building. The school will implement Still Thought’s education method to weave compassion, relief, honesty, and integrity into teaching. We will nurture the children in a loving and calm environment; motivate them to learn the Chinese language and culture in today’s diversified world. A creative still thoughts humanity and moral-principle course will be added to the curriculum to foster the children with virtue teamwork, great love, respect, calm, and thanksgiving.